Recently I had the chance to team up with a good friend who makes short thought-provoking videos on the intersections between faith and justice. 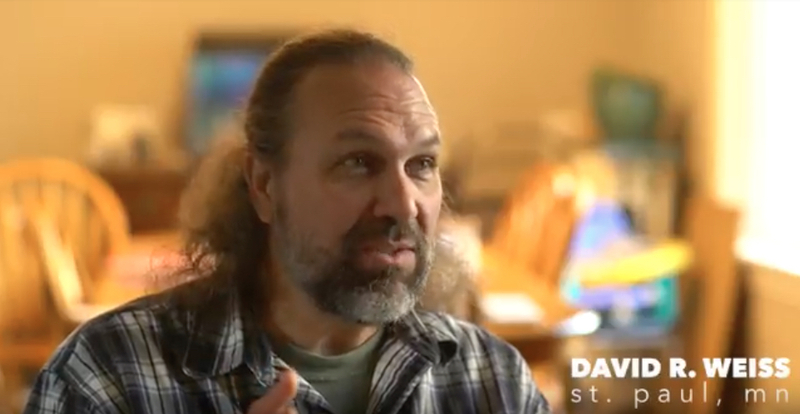 He interviewed me for a segment in his current series of videos on “White Jesus.” The series explores the way that our traditional image of Jesus (as someone who could pass as a West-European white man) is actually a (mis)representation that helps secure a system that privileges white people. It’s a variation of the same dynamic that’s at play with male god-imagery, which helps privilege men in our society. When God Was a Little Girl, through its story—and its illustrations, works to challenge both dynamics. You can hear my short three-and-a-half minute video here. You can learn more about my friend Jason’s work through ANKOS films here. That was Greg Pierce talking to me back on June 27 (2015). We were both vendors at the Intentional Eucharistic Community (IEC) Conference being held at Concordia University in St. Paul. The conference was organized by and for liberal/progressive Catholics, emphasis on really liberal and really progressive. Many IECs openly welcome and affirm LGBT persons and regularly gather for worship—including Eucharist—without a priest … or with a womanpriest. Pretty much my kind of people, which is why I spent the money to get a vendor table to display When God Was a Little Girl. 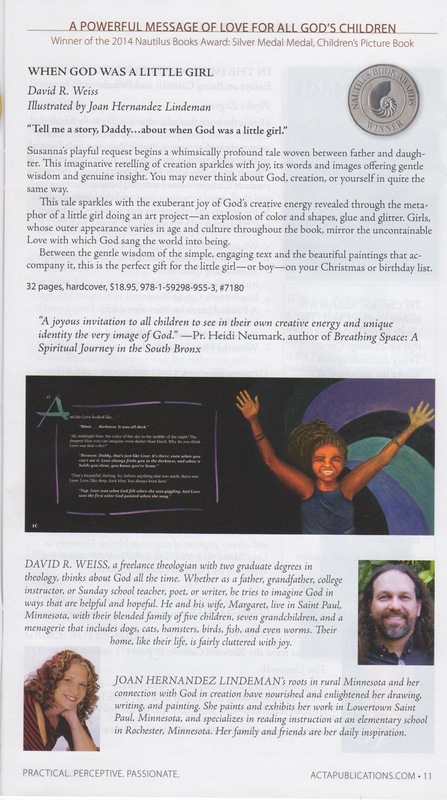 Greg’s intro to our book at the start of the fall catalog. After that first meeting in late June, Greg began making plans to feature the book in his fall catalog—simply as a book they were going to distribute. Over the next couple of months we brought Joan into the conversation as well and began negotiating the terms of a contract. In mid-September we officially signed on to have When God Was a Little God published by ACTA Publications. Next week (mid-November 2015), the first copies of the new edition will be printed in Chicago! The first of TWO full pages devoted to our book in the fall catalog. We are so excited!—and so is Greg at ACTA. Since July he’s already sold 300 copies of the book acting as our distributer. The last seventy sold in a single weekend at the annual Call to Action Conference in Milwaukee for progressive Catholic social justice activists. When he becomes the publisher he will have added incentive to put even more marketing energy into the book, something he’s far better positioned to do than we are. Where does that leave Beaver’s Pond Press? Well, with our eternal gratitude. The warm reception we received from Lily Coyle when we first showed them our “draft copy,” the careful guidance we received from Hanna Kjeldbjerg, our “mentor” there, the excellent graphic design done by Jenna Larson (freelance—not with BPP), and the professional quality printing that Beaver’s Pond did for us—all these things gave us a book that was a success in its own right, and one that caught Greg’s eye for ACTA. But as a mentoring/self-publishing press, while Beaver’s Pond gave us an outstanding (award-winning!) book, they aren’t set up to market it; that remained for me and Joan. And, honestly, as much as we love the book, neither of us had the time, energy, or money needed to give the book all the advantages it really deserved. But we couldn’t take this next step if Beaver’s Pond hadn’t done such a fine job for us on the first step. And they are just as pleased for us as we are. Our getting picked up by ACTA is a ringing endorsement of the quality of their work. Why ACTA? Well, because they came to us with excitement. But also because Greg is convinced that there are a lot of liberal/progressive Catholics who will be overjoyed to find a message that is so feminine-affirming in a church that is still playing catch-up on this issue. And ACTA already has a solid reputation and a whole sales network reaching into several hundred Catholic bookstores across the country. Only Catholics? 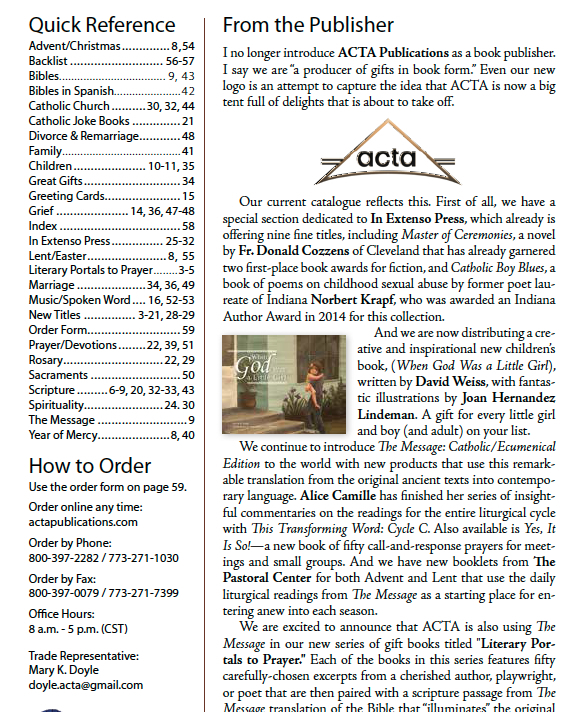 No, ACTA is a Catholic publisher, but they attend a variety of religious book conventions. Plus, through ACTA our book will continue to be available to bookstores of every type as well as on Amazon. Can we still get it trough you? Yes! Joan and I will continue to have access to the books for our own sales at a good discount. We’ll be able to do direct personal sales on our own, and we’ll continue to offer the book through our website here (which is still a better deal for us than Amazon—let the folks who don’t know us use Amazon). And we’ll still be able to take books with us to any special events we do in person. By the end of November we’ll get our first inventory of ACTA books. So will you be earning “royalties” then? Why, yes, we will! ACTA will take over responsibility for printing, storing, shipping, and marketing the book, so they’ll keep the largest portion of sales to cover their costs and to earn their profits. But we’ll each receive a equal royalty on each book sold. It will be much less work on our part, and if Greg is right about the book’s potential, well, we won’t get rich, but we might see a steady trickle of modest income for the fruit of our long labor. Will the book change? Hopefully only for the better. We’ve updated the back cover because we received several new endorsements from prominent theologians since our last printing. The interior pages will remain exactly the same, except for replacing “Beaver’s Pond Press” with “ACTA Publications.” The front cover will now have images of both our national awards embedded right in the artwork. And, most significantly, the book will be digitally printed. Print experts tend to agree that offset printing has the absolute best image quality, but digital printing is fast catching up because it’s relatively easy to make fine adjustments. Plus, digital printing is a much “greener” process than offset printing, so overall it’s a trade we’re happy to make. For ACTA the biggest advantage is that digital printing allows them to print smaller quantities on a quick turn-around at an economical price. As a small publisher with over a hundred titles in print that saves them tremendously on storage costs while letting them respond quickly when sales are strong. Bottom line: we are 100% confident that the ACTA edition will have the same high quality that our Beaver’s Pond Edition did. Is the Beaver’s Pond Edition all gone? Pretty much. Altogether we printed about 2800 copies under the Beaver’s Pond logo. And we’ve sold over 2600 of them. We probably sent out about 100 copies as samples or for review, and Joan and I have each set aside a box of 25 “for posterity.” As excited as we are for the ACTA edition—the book now has a real chance to reach much further than we could have taken it on our own—the Beaver’s Pond Edition was truly “ours”: a journey that Joan and I took from start to finish. It will always be special in its own way. Any other kudos? Of course, we’re grateful to everyone—and naming anyone risks missing others. The one I’ll name is St. Paul’s Ten Thousand Villages store on Grand at Victoria Crossing (but soon moving to a new—and yet unknown—location). Some of you know that for 5 years (until she started college), Susanna and I were a father-daughter volunteer team at that store. When I first asked the manager about selling the book she was cautious, since it isn’t about Fair Trade (which is TTV’s focus). But when she saw the final book, with its spiritually-inviting story and rich multicultural art, she took a risk on it. Since December 2013 that one store has now bought 250 copies from us! We’re so grateful for their being willing to take a chance on us. More than any other retailer, they’ve helped send many copies off to good homes. Anything else exciting on the way? I’m glad you asked! I mentioned above that Greg is committed to seeing ACTA respond to the needs and aspirations of contemporary Catholics. And the fastest growing segment of the Catholic church is Hispanic. So I’m excited to share that sometime in 2016, also through ACTA Publications, we’ll be releasing a Spanish translation of When God Was a Little Girl! 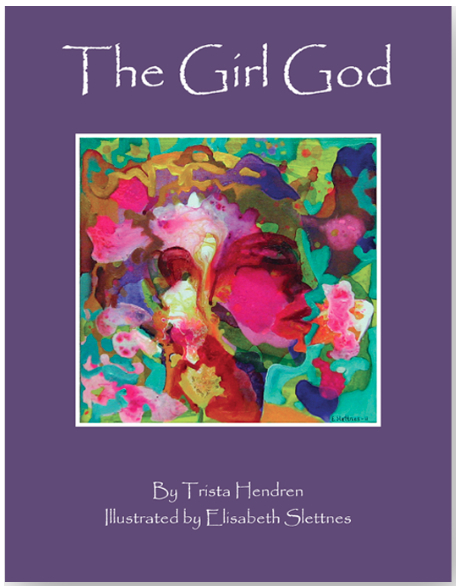 The Girl God (© 2012 Trista Hendren, illusrations by Elisabeth Slettnes). 40 pages, paperbound; available at www.theGirlGod.com. The Girl God is really a threefold treasure: story, art, and wisdom. The story, a simple children’s tale that will have timeless echoes in the heart of many an adult, recounts an exchange between Trista and her daughter, Helani. Inspired by a sneeze – talk about incarnational theology! – (and the Muslim blessing that Trista says after it) they explore Helani’s difficulty in feeling God within her. Along the way they discover that Helani immediately senses the Goddess within her … the Girl God. The tale is a poignant reflection on the importance of having metaphorical references to the Divine that are accessible and empowering to all of us – of all ages, genders, and more. If we can acknowledge that the Holy (whether named God, Goddess, the Universe, etc.) is closer than our own breath and yet wholly beyond the reach of our words, we realize that the multiplicity of ways we seek to name and image the Sacred are not steps by which we stray from a narrow paths but rather a joyful dance through a garden overflowing with beauty. If Trista’s narrative begins that dance, Elisabeth’s illustrations turn it into a frenzy of delight. Her paintings do not so much illustrate the story as they beckon beyond it. Bold and vibrant, they evoke the magical-surreal interplay of divine, human, creature, and nature. Both children and adults will see much (and I bet see rather differently) in and through Elisabeth’s art. Finally, nearly every page of the book has a subtext of feminine/sacred wisdom. Thirty-five quotes in smaller text adorn the lower parts of the pages. Drawn from multiple faith traditions and from feminist writers, they make this a book to appreciate not simply for the story or the art, but for these invitations to linger in the words of others as doorways for our own self-reflection and growth. This is a delightfully rich book that can spark conversation and reflection on many levels – and one worth returning to again and again. David Weiss is a theologian, essayist, hymnist, poet, and author of When God Was a Little Girl (www.WhenGodwasaLittleGirl.com), a playfully profound creation tale. Heidi Neumark is a Lutheran pastor and author. I don’t actually know her at all. But my friend, Laura, read her Heidi’s recent blog post, “Fifty Shades of Changing the Subject.” In it she laments both the challenge of biblical metaphors that seem only to make movement toward racial justice more difficult, but more specifically the way that many pastors try to side-step even asking the question about that. Because Laura liked the way I treated darkness in my new children’s book, When God Was a Little Girl, she said quite bluntly, “I wish you’d write something in reply to her post.” Okay, I have. Heidi, I appreciate your choice to wade into this conversation. At my church we recently had the youth with us during an adult forum; they co-led a sort of “base community” engagement with a Scripture passage, John 8:12 — Jesus as the Light of the world. We are mostly a white congregation, but our youth, reflect our few black families as well as several children adopted from Africa. It was painful for me to listen as these dozen kids — over half of whom were brown- or black-skinned were led unwittingly into a spiritual lesson about Light. Asked to reflect on ways that their lives walk in the Light. Asked, also unwittingly, by adults responsible for their spiritual nurture to become accomplices in making Light/Dark a central set of axes in their spiritual world, only to learn all too late that their skin suddenly becomes the Adversary in the worst way long after the deal is struck. I say to both you and your colleague on the border, play mischief with (or subvert altogether) the biblical tendency to give whiteness the upper hand over darkness. It may be an understandable preference in our past, but it becomes an intolerable bias in our present. Perhaps some biblical texts are just waiting to be argued with — their revelatory truth unveiled in our opposition to them. Liberatory mid rash. Push back. Because the way that race roils in our nation today … no less on Sunday mornings than the rest of the time … we need a richer array of metaphors if we’re truly more interested in offering news that is good rather than simply repeating verses with value-neutral (read: “deadly”) accuracy. Hanna Kjeldbjerg is our “book mentor” at Beaver’s Pond Press, which means she is our editor-plus. She’s responsible for advising us on all editorial decisions (although Joan and I always have final say), but she is also our “project manager”: tracking deadlines, communicating with designer and printer, etc. She recently interviewed me for a blog post about our use of Kickstarter to “crowdfund” our book. You can find her final blog post here, but the full interview is below. It was fun to respond to her questions — and offers another behind-the-scenes glimpses of our book project. And remember, through November 24 we are STILL seeking contributions on Kickstarter! We’ve reached our goal, but have still only covered 60% of our total budget. Pledging now is the best way to insure the project is a success for us … and the only way to guarantee you get a first-run signed copy of the book before Christmas! HANNA: One of the most beautiful things about When God Was a Little Girl is that you created it for altruistic reasons, not solely to make a profit. Can you explain what drove you to create this book? DAVID: Wow – that’s a complicated question with a lot of answers! Here are a couple. I teach theology and have been deeply shaped by feminist theology. I believe the way we imagine God impacts the way we see ourselves and the way we assign value in the world. 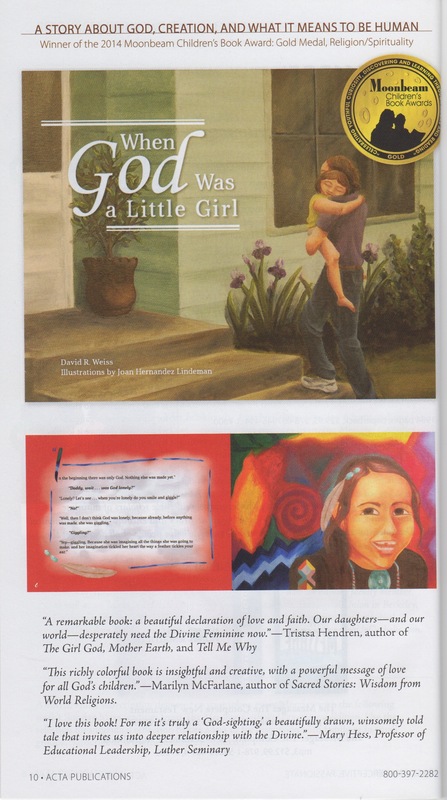 As a dad, I wanted my daughter, Susanna, to grow up being invited from early on (she was just five when I wrote the story) to see herself fully “in the image of God.” And because Susanna was always thrilled to do art projects, it seemed a perfect way to portray the creation of the world – as a project carried out with exuberant joy by a little girl. Of course, while I wrote the story for Susanna, its message can reach little girls and grown women everywhere. In fact, one of my former college students told me that reading this “children’s story” is what finally gave her the confidence to claim her call from God to pursue parish ministry – and today she is a pastor! Also, when I began my career teaching Introduction to the Bible, I always enjoyed helping students discover rich meanings in stories they had only ever known on a superficial level. I assigned my college students to read children’s bible story books and then write a review describing how well the author seemed to capture the meaning of the original story as we had studied it in class; most story books never even scratched beneath the surface. This story does. One small example: in the Hebrew it says God fashioned an “adam” (literally: earthling) out of some “adamah” (literally: dirt). Clearly the original author of Genesis meant to remind us we are kindred creatures to the soil itself – and ought to treat it like family. We completely lose that when the English just says, “God created man from the dust of the earth.” So in my tale God takes some rich, dark dirt, what we call “humus,” and fashions “humus beings.” The wordplay returns, along with the deeper – and more important than ever – reminder of our kinship with the earth. HANNA: Thirteen years have passed from the first text to the final layout. Can you describe what it will mean for you to finally see this book in print? DAVID: It is like the sweet ending of a long journey … and, at the same time, the beginning of a new one. There is a final sense of completion, but also the excitement that the finished book begins a whole new phase of the story. Ironically, Susanna is now a high school senior, and just as I brace myself (with excitement) to see her step out into the world on her own two feet, I will watch my book step out into the world on its own two covers, so to speak. Almost magically, Susanna, who was once so enchanted by art and earth will head to college to study chemistry because she finds so much “beauty” in the earth-patterns revealed in chemistry. HANNA: Your Kickstarter campaign began on October 25, and in eighteen days you have already surpassed your goal of $5,000 and received the support of over 100 backers. Although many Kickstarter campaigns are successful, running one is not easy—it takes a lot of work around promoting and leveraging your networks, and exercising every connection you have to drive traffic to your page. How do you account for your (dare I say wild?) success? DAVID: Hard work, undaunted determination, and (dare I say wild?) enthusiasm for our book. You’re right, only a relative handful of people actually search Kickstarter for projects to fund. And even posting it on your Facebook wall may only elicit a lots of “likes” to your post, but those “likes” rarely translate into pledges. I learned during my first Kickstarter campaign, that you can either (a) be disappointed that so few of your friends immediately race over to Kickstarter and pledge, or (b) you can be so excited – almost like a little kid eager to show off a new art project! – that you’re willing to invite them to “check it out” as many times as you need to, until they actually do. I don’t know the data, but I really think that a good percentage of people who visit the Kickstarter project page itself get excited and decide to pledge. But you need to work hard to get them there. That’s just a given. But if you have wild enthusiasm, you know they’ll be glad when they finally reach the page. I think it’s also fair to say that the uniqueness of our project helps sell itself. If you’re a woman, or if you have daughters or granddaughters, there just aren’t a lot of stories out there that so playfully and beautifully offer a glimpse of God as a divine feminine. I hope the story appeals beyond just women, but, let’s face, that’s over half the population – and bible stories have underserved them for a LONG time! HANNA: What different sources have directed traffic to your Kickstarter page and resulted in donations? DAVID: Let’s see, Joan (the illustrator) and I have used Facebook, email, my blog, and old-fashioned little paper cards that I can hand out whenever it comes up in conversation. HANNA: This is not your first Kickstarter campaign—you also used Kickstarter to help fund your book of hymns “for a church hungry for welcome,” To the Tune of a Welcoming God. This Kickstarter campaign ran from the start of Pentecost season to the end of Pride weekend because, as you mentioned on your blog, “both of these festivals are about God reaching out to claim God’s children and bring them home.” The project not only successfully reached its goal of $1,066, but people continued to donate after the goal was met. The campaign ended up raising $3,540, which is absolutely astounding. What did you learn through that first Kickstarter campaign? DAVID: First, that project was for a CD, not a book. Easy to get confused because it shares its title with an earlier book of both essays and hymns by me. (People can find these at www.tothetune.com) But this was a CD recording of those hymns. Mostly I learned … through a couple of anxious low funding weeks) the need – and the payoff – of abundant one-to-one messages. Kickstarter offers name-recognition, trustworthy credit card security, and a great platform to show off your work. But you need to drive people there. HANNA: One great thing about Kickstarter is that it jumpstarts the excitement for your book’s release. You already have over 150 signed copies that have been pre-ordered through the campaign. How does it feel to be aware of the buzz for your book growing? DAVID: This is so cool. We have a book that can sell itself once it gets into your hands. And to know that yet this year 150 copies will be launched like little marketing events each time it gets read, that’s very cool. Of course, Joan and I hope to make back our initial investment and even earn a little something from the book, but what really excites both of us is the chance to see our words and our images change the world by touching one imagination at a time. HANNA: What does it mean to you to receive the financial support of the Kickstarter campaign? DAVID: This is both affirming, but also absolutely critical. Joan and I both live on very modest budgets. Neither of us has the capacity to fund a project like this on our own. Even borrowing the total amount would put our respective family budgets in a tight place. So this HAD to be a community project. We needed the financial support simply to make it possible. But to see it come in so strong has been a powerful affirmation of our work across so many years. Of course, I need to say, too, that OUR CAMPAIGN IS STILL GOING (visit it at: http://www.kickstarter.com/projects/209579395/when-god-was-a-little-girl). So far we’ve met our Kickstarter goal, but that only covers 50% of our total budget. It was a big milestone to reach, but with 10 days still to go, every contribution helps us get closer to funding the rest of the project – and there’s still plenty to fund! Plus, anyone who pledges to the campaign at $30 or more will get their own signed copy of the book in time for Christmas! HANNA: What wisdom or advice would you give to other authors who are looking into doing their own Kickstarter campaign? DAVID: Gosh, I’m hardly a crowd-funding guru! I guess I’d offer the following. (1) Do it. You will learn the most by doing a campaign. Even if your first one fails, you’ll learn more by running a campaign than by reading about it. But here are a few other tips. (2) Offer a clear budget. People seem more willing to projects that can state clearly what the money is paying for. (3) Be realistic and conservative with your “goal.” Kickstarter process all your pledges IF you meet your goal; they process none of them if you don’t. It makes good sense (you can read their philosophy on their website). But it does mean you shouldn’t necessarily have your goal match your budget. And that’s a tricky dance. I think on our book project we set our goal a little too low, because funding excitement can slow down if people see you’ve met your goal. But it does feel good to now our pledges are secure; we just need to keep the buzz alive. That’s it. Crowd-funding can be nerve-wracking, but it’s also exciting because it builds buzz for your project the same time it brings in funds – and, without question, it reminds you that people “out there” some of whom you may never meet, are eager to join in your work. Remember, through November 24 we still need your support at Kickstarter — thanks! The last few days we have been reviewing our proofs for the book. This is a “trial copy” of the book done at the printer using the actual print files. Exactly what you see now is what you’ll get 1500 more of. So make sure it’s EXACTLY what you want to see and how you want it to look. We caught several tiny changes. Which is the whole point. Catch them now, before you have 1500 more just like them. Twelve keystrokes is all it took to correct several small errors (most of them technicalities that would’ve escaped 90% of our readers. But you want to get as close to perfect as possible. And that’s what proofs are for, bless them. But then, this last change was the hardest. Seven more keystrokes that I have begrudgingly accepted — but I’m NOT happy about it! The rule. The rule, you see, on title capitalization is pretty clear. Verbs take uppercase. But “was” is such a such word. On the cover it looks so right in lower case. In fact, in every iteration, from front cover to title page to back page to website address, “was” looks exactly right. But the rules don’t really care. Doesn’t matter that it’s such a such word. Even “is” belongs in upper case, say the rules. It’s a verb. End of discussion. Who cares?! It’s OUR book. It’s MY title. I’m the author. And, actually, I DO have final say. I can overrule (get it? over-rule) the editors if I wish. Call it a stylistic preference — because that’s what it is. Not an error or an oversight, but an intentional choice on my part. But. Besides rules there are Awards. (That was an unnecessary but intentional upper case “A” to capture the near-sacred character of these things.) Beaver’s Pond Press, our publisher, has a very good track record on awards for independently published books — they may well be one of the most-awarded independent publishers in the country. And the editors at Beaver’s Pond Press are very hopeful that our book has what it takes to garner some awards. But still: rules … damn them. And when you see the finished book, with the upper case W in “Was,” try not to stare. It’s already going to feel pretty self-conscious. Finally, the Kickstarter campaign is off and running. We’re doing very well, with about two more weeks to raise funds. We really hope to soar right by our $5000 goal since we’ll have $10,000 in bills to pay. Pledges are welcome; generosity is encouraged. The book is beautiful. You’ll be glad you did. Overnight the world changed. Did you feel it? Last night Jenna, our designer, uploaded the print files for our book to the printer. And this morning Jenna-2, the printer’s rep (who ironically happens to share the same name as our designer! ), downloaded the files at their end. Meanwhile, also yesterday, Hanna, our editor/mentor at Beaver’s Pond Press, sent over the work order, confirming that our credit card is ready to cover the print charges (oooooooooh, that was a big scary swipe on the credit card!). Today we’ll be assigned a spot in the printer’s line-up of print jobs. Okay, give us another 1500 of these!! And then it really begins! Planting seeds. So many loose (almost rebellious) ends to bring together to make the book ready for birth. One of them is launching this website. Lots to fill out on these pages, but the soil has been turned and a few seeds tossed in here and there. Back later.